Via Josh Gerstein comes news of this latest ruling in League of Women Voters v. Newby, concerning a directive from EAC director Newby allowing states (including SOS Kobach’s Kansas) to require documentary proof of citizenship before using the federal form to register in federal elections. This is a long-running dispute that has played out in numerous lawsuits and numerous courts across the country. Judge Leon has already been reversed once by the D.C. Circuit on his temporary order. But having the Election Assistance Commission decide this will put it in a tough spot, and it could well come down to the position of the new chair, Commissioner Masterson. 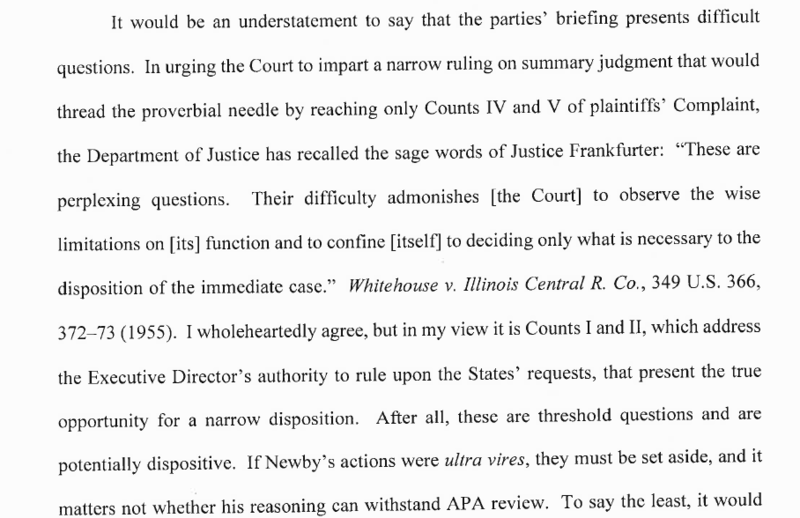 It was clear in earlier aspects of this dispute that Commissioner Hicks believes Newby acted without authority and Commissioner McCormick likely believes Newby had authority. Masterson, like McCormick, is a Republican appointee but a straight shooter. Hicks is the Democratic appointee and the other Democratic seat remains vacant.